In addition to iDTGV and iDBUS we have now added another low-cost carrier, OUIGO, on Capitaine Train. 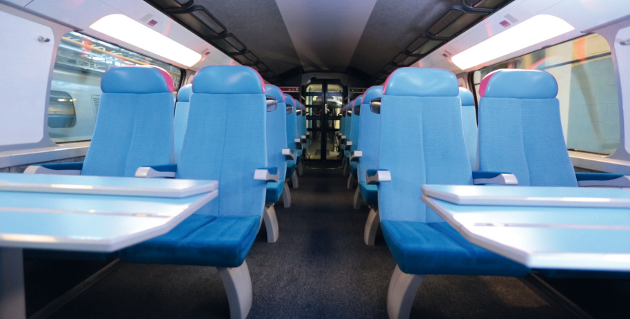 It’s a new French high-speed rail operator (a SNCF subsidiary) which offers extremely low prices, especially for connections in the South-East region. Tickets start at €10 for adults and from €5 for children. The tickets are not refundable but may be exchanged for other OUIGO tickets. You can bring along one piece of cabin-sized baggage and one piece of carry-on baggage for free, and every additional piece costs €5. There is only one travel class on these blue and pink trains. OUIGO covers routes between Marne-la-Vallée and the South-East of France (Lyon, Marseille, Montpellier, Nîmes, Valence, Avignon, Aix-en-Provence… See the map below). The launch of OUIGO on Capitaine Train coincides with the OUIGO Christmas sales, which start today. By the way: Christmas sales for SNCF tickets open October 17th, Deutsche Bahn (DB) October 15th. Hi, I’m looking forward SO much to using Capitainetrain but the Web pages just don’t perform on Android (Samsung galaxy s3). I can’t activate fields (for example select passenger), and it really just doesn’t work. Hope you can get this fixed. Could you pass this on to the tech guys please? thanks for your feedback! I will provide this info to the devs, We are working on an Android app, so there is something to look forward to. The website isn’t really optimised for mobile browsers.